For the first time in United States Army Forces Command history, a woman was appointed to lead the largest command in the Army representing 776,000 soldiers and 96,000 civilians. For the first time in United States Army Forces Command history, a woman was designated to lead the largest command in the Army representing 776,000 soldiers and 96,000 civilians. Lieutenant General Laura J Richardson has emerged as the first female to head the US Army’s largest command FORSCOM which is based out of Fort Bragg in North Carolina. 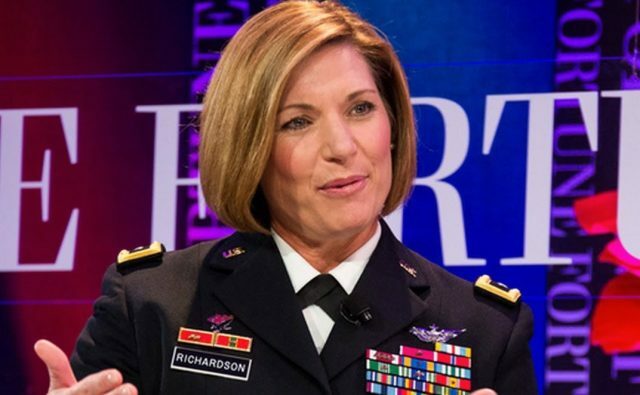 In declaring the choice, Army Chief of Staff Mark A. Milley indicated that Richardson could expect to be the acting commander for several months, and was being considered for permanent assignment to the post. Richardson previously served in the US Army. She has formerly served as the military aide to vice President Al Gore between February 1999 and January 2001. From July 2002 to May 2004 Richardson was commander of the 5th battalion of the 101st Aviation Regiment and served with that unit on Operation Iraqi Freedom. During that time, she was featured on the cover of the March 24, 2003 edition of Time magazine.